Shankar, P., Prasanna kumar, B., khallel, M. (2011). Hepatoprotective Activity of Momordica diocia Roxb Fruits in CCl4-Induced Hepatotoxicity in Rats. Iranian Journal of Pharmaceutical Sciences, 7(4), 279-282. P Shankar; B.R. Prasanna kumar; Mohammed khallel. "Hepatoprotective Activity of Momordica diocia Roxb Fruits in CCl4-Induced Hepatotoxicity in Rats". 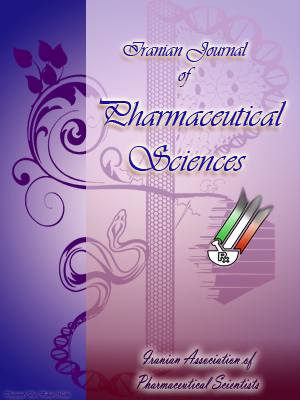 Iranian Journal of Pharmaceutical Sciences, 7, 4, 2011, 279-282. Shankar, P., Prasanna kumar, B., khallel, M. (2011). 'Hepatoprotective Activity of Momordica diocia Roxb Fruits in CCl4-Induced Hepatotoxicity in Rats', Iranian Journal of Pharmaceutical Sciences, 7(4), pp. 279-282. Shankar, P., Prasanna kumar, B., khallel, M. Hepatoprotective Activity of Momordica diocia Roxb Fruits in CCl4-Induced Hepatotoxicity in Rats. Iranian Journal of Pharmaceutical Sciences, 2011; 7(4): 279-282. Fruits, leaves and tuberous roots of Momordicia diocia are used in India as a folk remedy for treatment of a wide range of disorders. The objective of this study was to evaluate the hepatprotective activity of the fruits of Momordicia diocia by preparing different extracts and the resultant extract were screened for the hepatprotective activity. The ethyl acetate and ethanolic extracts of Momordicia diocia fruits were prepared and subjected for phytochemical screening and tested for their hepatprotective activity in CCl4-induced hepatotoxicity in rats. Phytochemical screening showed positive test for steroids, triterpenoids and glycosides (Etoh extract). The ethyl acetate and ethanolic extracts showed a significant hepatprotective activity at a dose of 200 mg/kg (p.o.). The results suggested that Momordica diocia fruits possess potential hepatprotective activity against CCl4 hepatotoxicity possibly by antioxidant activity. Momordica diocia Roxb.Ex. Wild. (Cucurbitaceae) is a perennial dioiceous climber with tuberous roots found throughout India from Himalayas to Ceylon, up to an attitude of 1,500 m. The plant is sometimes found growing wild and is common in hedges. It is often cultivated for its fruits, which are used as vegetables . The whole plant is used for the treatment of eye diseases, poisoning and fever . Juice of the root is stimulant, astringent and antiseptic, and tubers are used in cases of bleeding piles and similar infections. Plant is claimed to be expectorant, analgesic and soothing agent. Root is also used to stop bleeding from piles, as an expectorant and also in urinary and bowel complaints . Fruits, leaves and tuberous roots used in India as a folk remedy for diabetes . The aqueous extract of root has spermicidal activity and anthelemintic activity . The roots are reported to possess moderate antimicrobial activity and poor antifungal activity  and postcoital antifertility activity . Phytochemical investigation has revealed the presence of traces of alkaloids and ascorbic acid in fruits. Lectins, β-sitosterol, saponinglycosides, triterpens of ursolic acid, hederagenin, oleanolic acid, α-spiranosterol, steraic acid, gypsogenin, momodicaursenol, two novel aliphatic constituents [4, 7-9]. To the best of our knowledge no report is available on the hepatprotective activity of momordicia diocia fruits. Hence the present study was undertaken to verify and evaluate the hepatprotective activity of fruits of momordica diocia by preparing various extracts and the resultant extracts was screened for the hepatprotective activity. Fresh fruits of M. dioica were collected during July-August, 2007 and identified and authenticated by Dr Gajendra Roa, Department of botany, Regional Research Institute, Jayanagar, Bangalore. An authenticated specimen was deposited in the herbarium with voucher no: 43525 for further reference. Fresh fruits of M. dioica (5 kg) were crushed and extracted successively with ethyl acetate and ethanol in a soxhlet extractor and yield was 0.42, and 0.58%, respectively, on dried weight basis. Freshly prepared extracts were tested for the presence of alkaloids, steroid and triterpenoids and their glycosides, tannins, flavonoids and their glycosides, carbohydrates, and cardiac glycosides using standard procedure . Male Wistar rats weighing 190-210 g were used in the experiment. They were maintained in standard environmental conditions of temperature (25±2 °C) relative humidity (55±10%) and 12 h dark/light cycle. They were fed with standard diet (Hindustan Lever, India) and water ad libitum. The animals were divided into five groups of six rats each. Group 1: served as control and received the vehicle (1 ml/kg/day of 1% (w/v) gum tragacanth p.o. for 14 days). Group II and V received 0.1 ml/kg/day of CCl4 i.p. for 14 days; Group III animals received the standard drug silymarin  (Ranbaxy lab, dewas) in the dose of 100 mg/kg/day, p.o. for 14 days, while the ethyl acetate and ethanolic extracts of Momordica diocia were administered to Groups IV and V in the dose of 200 mg/kg/day, p.o., respectively, for 14 days. The CCl4 and silymarin or the extracts were administered concomitantly to the respective groups. All of the animals were sacrificed on the 14th day under light ether anesthesia. The blood samples for each animal were collected separately in sterilized dry centrifuge tubes by carotid bleeding and allowed to coagulate for 30 min at 37 °C. The clear serum was separated at 2500 rpm for 10 min and subjected to biochemical investigation Viz, total bilirubin , total protein , serum alanine transaminase, asparatate transaminase , and alkaline phosphatase . Results of Biochemical estimations are reported as Mean±SEM of six animal in each group. The data were subjected to One-way ANOVA followed by Tukey’s multiple comparisons test, and p < 0.001 was considered statistically significant. Phytochemical screening gave positive tests for steroids, triterpenoids, and glycosides (Eth Ac extract) and steroids, triterpenoids and their glycosides (Ethanolic extract). The effect of ethyl acetate and ethanolic extract of Momordica diocia in CCl4 induced liver damage in rats with reference to biochemical changes in serum is shown in Table 1. The CCl4 treated control groups showed significant increase in serum total bilirubin, alanine transaminase, asparatate transaminase and alkaline phosphatase and a decrease in total protein indicating liver injury caused by CCl4, where as animals treated with ethyl acetate and ethanolic extract exhibited a decrease in total bilirubin, alanine transaminase, asparatate transaminase and alkaline phosphatase along with a significant increase in total protein. Tabel 1. Effect of ethyl acetate and ethanolic extract of fruits of M. diocia in CCl4 induced hepatotoxicity in rats. Values are expressed as Mean±SEM. n=6 in each group, *p≤0.01 compared to the control group. †p≤0.01 compared to the CCl4-treated group. @p≤0.01 compared to the CCl4 + silymarin treated group. The present investigation indicated that both the extracts of M. dioica fruits provide significant protection against CCl4-induced hepatotoxicity in rats. CCl4 is widely used as a hepatotoxin in experimental studies. CCl4 is biotransformed by the Cytochrome P450 system to produce the trochloromethyl free radical, which in turn covalently binds to cell membranes and organelles to elicit lipid peroxidation . Further, it has been found that several phytoconstituents have the ability to induce microsomal enzymes either by accelerating the excretion of CCl4 or by inhibition of lipid peroxidation induced by CCl4 . Phytoconstituents like flavonoids, triterpenoids, saponins, and alkaloids are known to posse’s hepatprotective activity, and phytochemical investigations of ethyl acetate and ethanolic extract of fruits of M. dioica revealed the presence of alkaloids, saponins, glycosides, triterpenoids and tannins [16-20]. The present study revealed that among the two extract tested, ethanolic extract of fruits of M. diocia found to posses a significant protective against hepatotoxicity induced by CCl4 which may be attributed to the individual or combined action of phytochemical present in it. However, further investigation is needed for identification of the active compound(s) responsible for hepatprotective activity. The authors are thankful to Prof. Mohammed Khallel, principal MMU College of Pharmacy, and Ramanagram for carrying out the research work in the institution. Sastri BN. The wealth of India-raw materials. New Delhi: CSIR, 1962; p. 408. Satyavathi GV, Gupta AK, Tandon N. Medicinal plants of India. Vol. 2. New Delhi: ICMR, 1987; p. 267. Karthikar KR, Basu BD, ICS. Indian medicinal plants. Vol. 2, 2nd edition. Allahabad. India: Lalit Mohan Basu, 1981; pp. 411-2. Sadyojatha AM, Vaidya VP. Chemical constituents of the roots of Momordica diocia Roxb. Indian Drugs 1996; 330: 475-5. Satyavathi GV, Raina MK, Sharma M. Medicinal plants of India. Vol. 1, New Delhi: ICMR, 1987; p. 317. Shreedhar CS, Pai KSR, Viidya VP. Post coital antifertility activity of the roots of Momordicia diocia Roxb. Indian J Pharm Sci 2001; 63: 528-31. Ghosh PN, Dasgupta B, Sircar PK. Purification from a tropical plant Momordicia diocia Roxb. Indian J Exp Biol 1981; 19: 253-5. Manjunath BK. Hepatoprotective activity of Pterocarpus Santalinns LF, an endangere medicinal plant. Indian J Pharmacology 2005; 38: 25-8. Luo L, Li Z, Zhang Y, Huang R. Triterpens and steroidal compounds from Momordica diocia. Yaoxue Xueuoa 1998; 33: 839-42. Farnsworth NR. Biological and phytochemical screening of plants. J Pharm Sci 1966; 55: 225-76. Mallory HT, Evelyn EA. The determination of bilirubin with photoelectric colorimeter. J Biol Chem 1937; 119: 481-5. Kingsley SR. The determination of serum total protein, albumin and globulin by the biuret reaction. J Biol Chem 1939; 131-7. Reitzman S, Frankel S. A colorimetric method for the determination of serum glumatic oxalo acetic acid, glutamic pyruvic transaminase. Amer J Clin Path 1957; 28: 56-63. Bessey OA, Lowery DM, Brick MJ. A method for the rapid determination of alkaline phosphatase with five cubic millimeters of serum. J Biol Chem 1964; 164: 321-9. Recknagal RO, Glende EA, Dolak JA Jr, Waller RLC. Mechanism of carbon tetrachloride toxicity. Pharmacol Ther 1989; 43: 139-54. Metha RS, Shankar MB, Geetha M, Saluja Ak. Hepatprotective activity of Trianthema portulacastrum. Indian Drugs 1999; 36: 241-4. Baek NL, Kim YS, Kyung JS, Park KH. Isolation of anti-hepatotoxic agents from the roots of Astragalus membranaceous. Korean J Pharmacog 1996; 27: 111-6. Xiong X, Chen W, Cui J, Yi S, Zhang Z, Li K. Effects of ursolic acid on liver protection and bile secretion. Zhong Yao Cai 2003; 26: 578-81. Tran QI, Adnyana IK, Tezuka Y, Nagoaka T, Tran QK, Kadota S. Triterpene saponins from Vietnamese ginseng and their hepatoprotective activity. J Natural Prod 2001; 64: 456-61. Vijyan P, Prasanth HC, Dhanaraj SA, Badami S, Suresh B. Hepatprotective effect of total alkaloid fraction of Solanum pseudocapsicum leaves. Pharm Biol 2003; 41: 443-8.